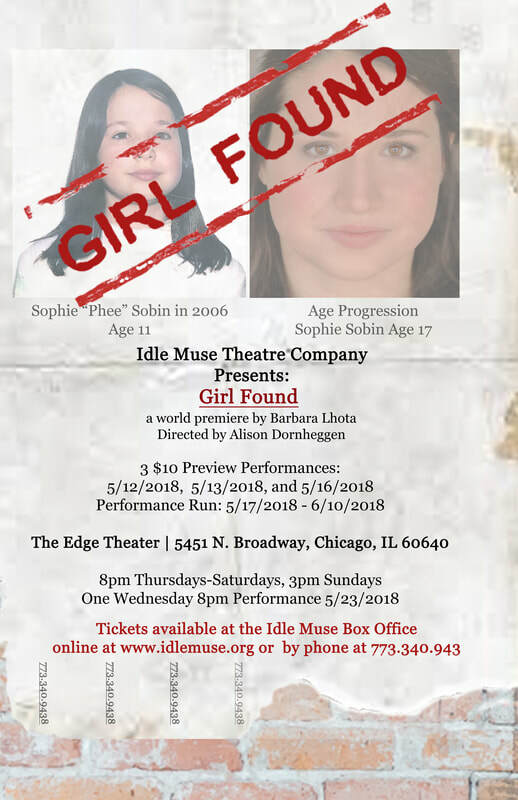 Inspired by true-life events, Girl Found explores how perceptions can be distorted in the desperate, primal pursuit of love. A seventeen-year-old girl who, six years earlier, went missing resurfaces in a youth shelter in Canada, with no memory of where she's been. Soon she begins to recall some facts including a name, “Sophie Sobin.” and is desperate to get her former life back. Her troubled mother, Eva, and her Aunt Ellie welcome her home, but Sophie and her faulty memories make this transition difficult. Sophie’s return restores some hope and new life to her damaged family, but chaotic past events begin to bubble beneath the surface. ​ARTISTIC STATEMENT - Thanks for being interested! In second grade, I was assigned an autobiography for my English class. Despite the fact that I grew up in Detroit immediately after the race rebellion and had plenty of horror stories to tell even at the ripe old age of seven, my autobiography read pretty darn vanilla. Better to keep things pleasant, I was taught, so my first autobiography is a laundry-list of facts - the names of my brothers and sisters, my mom’s and dad's jobs, and the hospital in which I was born. One detail, however, in my less than scintillating memoir stood out: I wanted to be a puppeteer when I grew up, which was unusual in a sea of doctors, teachers and auto factory workers. Apparently, making big money was never a high priority. As a puppeteer, I thought, the story is yours and you are all the characters, at least at the point in which you develop it. Growing up as a young kid in Detroit in the 70s, a city reeling with racial and economic tension, this kind of control seemed highly attractive. Also, the two talents I knew I had from an early age were verbal memory for what people said and a strong imagination. I could quite frequently soak up what my family or friends told me and remind them of their exact words. This is a skill that, as a youngest child, can be incredibly annoying but useful. I'm the youngest in a big Catholic family of scientists and mathematicians who are not always comfortable expressing themselves: pocket-protector types with big hearts who read a ton but tend to communicate a bit indirectly. I’m sure my post depression-era parents had discomfort with discussing the “dangerous” world I sometimes experienced as a child, but they provide with love, patience, wisdom, kindness and compassion—a kind of hope for the future. You were wondering what all this has to do with my plays. So here it is: I’m fascinated with what people don't say and what they hide. I'm fascinated with the fluidity of memory, miscommunication, prejudice, privilege and fear and how these things cause humans to hide their identities and past pains. Sometimes in a dangerous world hiding is the only way to protect yourself. So whether I am writing drama or comedy, my characters struggle to overcome their fears and prejudices so that they can discover their true selves and learn to more directly communicate to the world around them. I still view the world as dangerous but also full of good people, angels of sorts, who help you along the way. I hope my plays reflect that world.